The Advanced Land Observing Satellite "Daichi" was launched by the H-IIA launch vehicle No. 8 (H-IIA F8) at 10:33 AM on January 24, 2006. "Communication Technology in Space Application"
"I have long believed that JAXA should leave conventional satellite communication entirely to the private sectors and should actively challenge highly advanced technology development. Communication technology is indispensable in any space mission, and thus we need higher data transmission rate, higher efficiency and higher functional performance." President Tachikawa of JAXA gives a executive comment for space application technology. 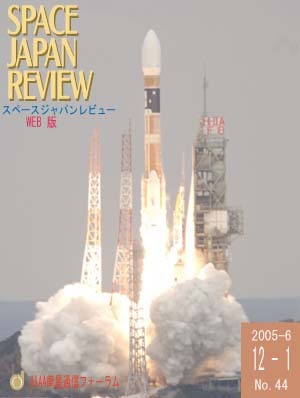 "Trends of research and development of optical space communications technology"
In Japan, the Optical Inter-orbit Communications Engineering Test Satellite (OICETS) developed by the Japan Aerospace Exploration Agency (JAXA) was launched in August 2005, and a laser communication link with the SILEX terminal was successfully established. By contrast, the National Aeronautics and Space Administration (NASA) canceled the Mars Telecommunications Orbiter project, which would have used a laser communication link between Mars and Earth in 2010. The research and development of optical space communications are being continued all over the world, and part of the technology is used for stratosphere optical communications. Recent trends of such research and development are reported. Low cost, High performance/Bench-top LSI tester "MST2000"
NEC TOSHIBA Space Systems Ltd.
"I had participated in the launch of the satellite in the JAXA Uchinoura space observation point last spring. The launch of the rocket went well, and the satellite obtained the orbit altitude safely. The satellite was named "SUZAKU�h in several hours after the launch. Usually, satellite can not get a name if the satellite does not reach the orbit. like ASTRO-E that had burned out before reaching the orbit. "SUZAKU�h has developed as a satellite of the re-challenge of ASTRO-E. For the launch of "SUZAKU" , I attended and prayed for its success." Mz. Mizushima talked her experience of launch failure and successful launch of satellites.